Thema der News: LAWS . Discovering the secrets of the new law about the animal protection, the the Minister of the Health has pubblicated on this mounth. Who are the races of dogs that are dangerous. The Association of the Center of Italy: ARCA 2000, has sent us the article about the Point of the Situation about Animal Prevention and Animal Rights in Italy. Il Programma Animalista Finally The Italian Animalist Party! The Italian Animal Party was born to defend the Animal Right and to work in the Institutions and Parlaments to build a new society that can respect the Animalism. Thema der News: THE ProgrammE . The protection of wild fauna and pets are very present ethical and ecological values and considered more and more important by citizens of all ages and social conditions. Together with local authorities the State should commit in founding local organizations helping to create a solid relationship with animals. Enforcing also their statutes with a commitment to the respect for animals. The regions, provinces and local authorities should guarantee that the national law 281/91 is kept, by working together with animal rights organizations in order to change the current regional law 86/99. The Annual Report of our Leader for a Animalist Politic in Italy. The Animlist Political Parties in Europe. Local authorities should plan and organize the provinces and regions with regard to salvage and care for wild fauna, battle against poaching and pollution. Regarding the protection of the so-called minor fauna (amphibious and reptiles), the local authorities have to intervene through appropriate regional laws in conjunction with the National Associations of Animal Protection. When buying cosmetics and cleaning products we have to be sure that the producing companies adhere to the standards of products that are really “cruelty free”. Our homepage (Home: vivisezione: Cosmetici e detersivi) contains a list with “cruelty free” companies that helps you find a shop in your area. Thema der News: THE ANIMALIST PartY . 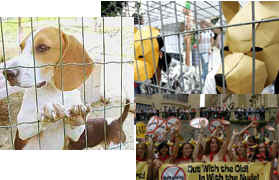 Thema der News: AGAINST THE KILLING OF ANIMALS IN EXPERIMENTS . Thema der News: WILD FAUNA AND HUNTING . The clearly visible separation between our nutrient needs and the cynical and cruel massacre of billions of animals.